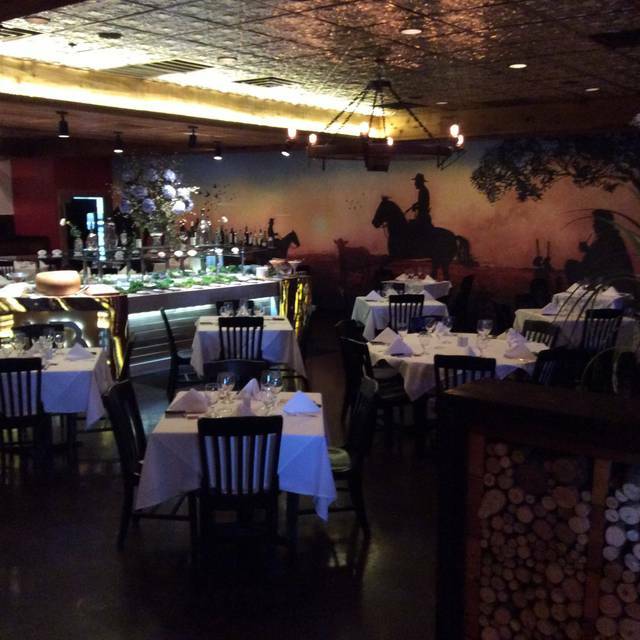 Traditional Brazilian steakhouse in the heart of Arlington entertainment district. Serving 16 different cuts of beef, chicken, pork and lamb. Enjoy our Gourmet Salad Bar featuring the freshest items available on the market just for you. Mother's Day. Celebrate at VB Gaucho Steakhouse Moms get 50% off on her meal. Make your reservation limited seat available for This Offer. Need to mention this ad to get the offer. We went here for Easter and my mom's birthday. It was our first time here, but not our first time to a Brazilian steakhouse. We'd been to Villa Brazil and Fogo de Chao previously. The restaurant was quiet, not too busy and we were seated quickly. Service was also prompt and our waiter was always close at hand and asking us how we were doing without being too intrusive. The food itself was superb and every one of us ate until we were bursting at the seams. All the meat was tender and delicious. We'll definitely be back. VBs was an incredible find for me a couple of years ago. I have always enjoyed Brazilian Steak Restaurants, but they are always so expensive. I was surprised at the regular price being so much less at night than others, and awesome service, awesome food, and awesome in every way. I had never been there for lunch, but I have been told it is even cheaper. I guess because it was Easter, they chose to charge me full price and then some. I have to admit I was a much surprised when I received the check. But even though I paid almost double than what I was expecting, it is still a great place. So the only thing is, don't make the mistake that I did. Don't assume that just because it is lunch, that it is lunch prices. I still highly recommend VBs. I will be back. The service was great, foods are amazing. Totally recommend. Service is beyond spectacular !!! Good food, good service, a little pricey but overall 5 Stars !! This was our 1st time and overall was great experience. We got very full and fast. The Fireball Cheesecake is out of this world amazing. We got it half off because we were celebrating our Anniversary. Would only recommend on special occasions. For the price it needs to be a special occasion and you need to love meat. There were two varieties that I enjoyed. The salad options on the buffet were plentiful. One disappointment: When I ordered a diet drink, I was brought a 8.5oz can for about $3. Hands down favorite Brazilian restaurant. Great service and amazing food. Can't wait to go back. Great customer service, even though we were 15 minutes late past our reservation, they gave us a table. Meat did not come around often.. and when did, was always the same meats. My FAVORITE Brazilian Steakhouse! Ryan is the bomb. Great service, delicious food, and a wonderful experience! We are frequent visitors of Brazilian steakhouses... mostly Fogo de Chao, Texas de Brazil, and Chamas do Brazil. We passed this restaurant on the freeway the other day and wanted to give it a shot. The ambiance of the restaurant was amazing. It is a small restaurant; it is cozy, quaint, and quiet. The staff was extremely friendly and made us feel welcome. The salad bar was extremely small, and the variety was lacking. The meat was very flavorful, however, and they carried most of the cuts we were looking for. The dessert selection was amazing, and their dessert chef creates beautiful presentations with his food. The wine selection was also great. I would have given this restaurant five stars if it wasn't for the tiny salad bar. It is a terrific place for a couple wanting to enjoy a private evening out! Went for a nice dinner with my honey. Enjoyed ourselves. Will go again. delicious Brazilian steakhouse, with all of the sides, coffee and dessert. The servers are very attentive and engaging. The food was great, plenty of it, and cooked to perfection. We will definitely go again! VB made our special occasion Awesome!!! They were ready to accommodate our large party and adapted when guests didn't show. I will definitely use them in the future!!! They are a hidden gem in Arlington!!! A very nice, clean, and friendly place, I would recommend this restaurant to all. Very nice place. Would definitely recommend to others. We had a wonderful time. And our waiter was the best !! So energetic, right on top of things, knows the food, good recommendations, friendly. I liked most aspects of this restaurant very much. I do not understand why it wasn't busier than it was when we were there. Most of the choices were very good. I didn't care too much for the fried banana or cornmeal things. They were not served in an appetizing manner and tasted like they had been sitting for a while. The cheese bread on the table was excellent--y'all need to push that more--It was delightful! The meat choices were good although a few choices seemed to have quite a bit of fat on them. The filet was good from one and not good from another later. The restaurant is beautiful. All in all, we would visit again. The waiter was very accommodating and didn't want to charge us for all of the children in our party as they really didn't eat much. The desserts, by the way, they did eat and adults did too! They were delicious. Thank you for serving us. I brought a group here for an appreciation dinner and everyone was extremely satisfied. The restaurant atmosphere is always amazing. The host and hostess are so kind and friendly with a great attitude. The food is phenomenal. The menu is always changing so you'll find a different array of meat samples to choose from. You won't ever by unhappy about making this a dinner/special occasion spots. I was looking for a great experience for my birthday dinner and VB exeded my expectations. The staff was extremely friendly and provided five star service! Will definitely recommend as we left with happy and full stomachs. We arrived at exactly 8 pm for our 8 pm reservation and were told by the hostess no tables were available and we would have a 30 minute wait. We asked twice to speak with the manager but never saw one the entire night. Food was excellent and we would certainly recommend them, but service all the way through was a disappointment. Very rushed and we had to wait too long to reorder drinks. So loud we couldn’t even hear the people we were with talk. Food was very good and fresh, I wish the inside was more updated. Inside felt very early 2000’s to me. But overall the food and service was great! Thanksgiving dinner was delicious. I would highly recommend. Staff was friendly. Atmosphere was amazing. Sat right back to a stoked fireplace for sons 9th birthday. Food was amazon except filet mug on wrapped in bacon wasn’t cooked enough. Small downside to an amazing experience.